While it is beautiful, Silverthorne, Colorado’s mountain location can be hard on the outsides of homes in the area. The harsh winter cold and snow can wreak havoc on a building’s exterior siding. Scottish Home Improvements is your team of Silverthorne siding replacement experts, having recently completed the re-siding of more than 2 dozen condo units along Highway 9. Since we have been in business for more than a decade and have won the BBB Gold Star for the past 7 years, we are a company you can trust. The extensive collection of siding products and the vast array of siding services offered by Scottish Home Improvements provides Silverthorne residents the opportunity to opt for siding that will improve the appearance of their home or business while simultaneously providing increased protection from the elements, reduced maintenance costs, and cost-effective energy savings. To learn more about how the Silverthorne siding replacement experts at Scottish Home Improvements can help you get more value and protection for your home, read on below. While we can install vinyl, steel, wood, or stucco siding, unless your home’s exterior is specifically designed to work with cedar or stucco, we generally recommend fiber cement James Hardie® siding to our Silverthorne clients. James Hardie® fiber cement siding is strong, durable, and fade resistant. This type of siding has also been demonstrated to be resistant to fire, termites, and woodpeckers, making James Hardie® siding great for Silverthorne mountain properties, as homes in this region are commonly afflicted by these pesky concerns. And it’s backed by one of the best warranties in the industry. Additionally, James Hardie® siding is offered in a wide array of colors and styles that can be cut to work in almost any home where wood has previously been used. For these reasons, James Hardie® siding is an excellent choice for Silverthorne homes. Outside of fiber cement siding, Scottish Home Improvements offers a range of siding options in Silverthorne. We’ve detailed a few of the many siding options we can provide below. In addition to fiber cement siding, our stucco-style siding options help Silverthorne homeowners achieve the look of traditional stucco without worrying about common concerns brought on by it, such as cracks or chipping. In this respect, stucco siding can be considered a superior replacement to classic stucco. Due to the industrial nature of steel siding, it’s not an option that many homeowners desire for their home. However, steel siding is a durable and low-maintenance option for commercial buildings, making steel siding options ideal for Silverthorne businesses looking to protect their properties in an affordable way. Homes in mountain towns like Silverthorne look stunning with stone siding. 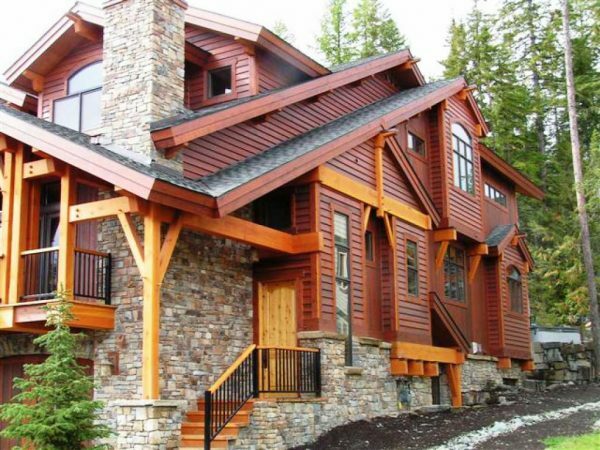 Stone siding beautifully compliments mountain scenery and makes a stunning addition to homes large and small. It’s perfect for creating accents for condos and townhomes or even on its own for single-family homes. Our siding experts will help you select the perfect style of stonework for your home and place accents in just the right places to make your exterior shine. If you’re like many homeowners in Silverthorne and love that log cabin look, you’re sure to enjoy the look of wood siding. Wood siding is a natural choice for homes in the mountains. It looks stunning on cabins in dense forest areas as well as country style homes in open plains or meadows. At Scottish, we carry multiple options for wood siding, including natural cedar, fiber cement faux wood, and engineered wood siding from LP SmartSide. Whether you’re working with a limited budget or you simply like the current look of your property, we understand that not every siding project calls for a complete replacement. Beyond siding replacement, Scottish Home Improvements also offers siding repair for Silverthorne properties of all types, from residential settings to commercial spaces. Call Scottish Home Improvements today to schedule your free consultation and learn more about how we can help you improve your home!